Ecuadorian cuisine is all about slowing down and savoring each bite, enjoying the company of close ones and our gifted settings. Growing up Ecuadorian in New York, opting to sit separately from the family table during meals meant not eating. We had to dine together, down each and every last flavorful crumb and never forget to compliment the chef, who in this case was my abuelita. Gratitude. Community. Culture. Food kept us connected to our roots from thousands of miles away: It wasn’t optional. My respect for the cultural richness of Ecuador‘s gastronomy only deepened when I moved to Quito last year, a sprawling old city staring the sun right in the face by day and flooded by a cumulus mist come evening. The country’s contrasting regions – coast, Sierra and Amazon – lend themselves to a diverse, healthy and colorful cuisine that comes out decadent through Quito’s cosmopolitan lens, and global foodies are beginning to take notice. Take a visual tour of the food in Ecuador with these six encompassing courses and you’ll be booking a ticket to the ‘middle of the world’ in no time. 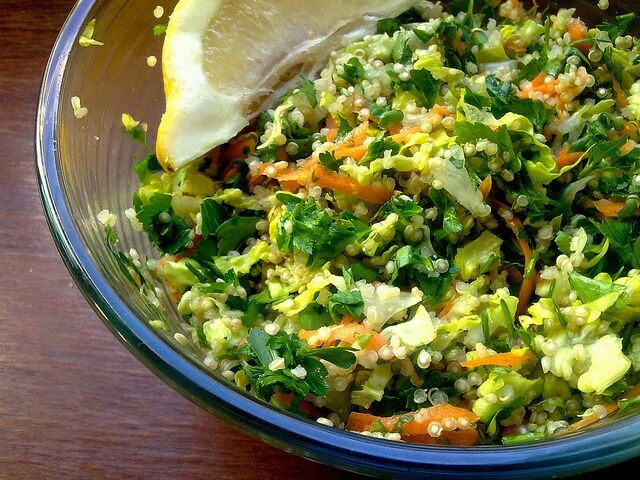 Quinoa Salad. Photo courtesy of Lablascovegmenu. The United Nations has designated 2013 “the year of quinoa,” a super food so packed with protein NASA makes their astronauts consume it. But before quinoa’s international status as the epitome of healthy eating boomed, it was a dietary staple consumed by the indigenous of the Andes for over 6,000 years. The chewy grains take on the flavor of whatever it’s cooked in, so recipes reach as far as your imagination can take you. Many eclectic indigenous communities speckle Ecuador’s diversified terrain, but the majority are counted amongst the Kichwas – a sect of the Quechua diaspora that live along the Andes. A divergent Kichwa identity exists where Ecuador’s mountainous slopes collide into the doorways of the Amazon in the East, and it’s evident that the jungle’s lively nature influences their culture. Flavors here are local, fresh and fierce, with the most exemplary fare known as maito, meaning ‘wrap’ in Kichwa. Women slow-steam fish — usually tilapia or the native carachaza — with cassava and hearts of palm in bijao leaves over charcoal. The fragrance of these banana-like leaves permeates the dish, enticing and overcoming the senses. Quimbolito. 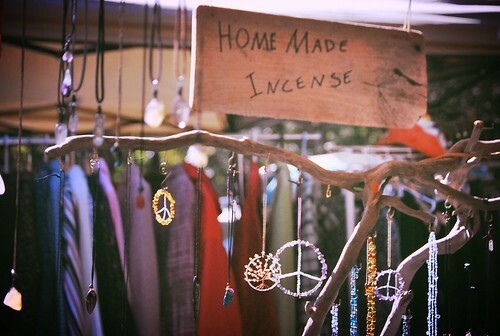 Photo courtesy of Bani Amor. 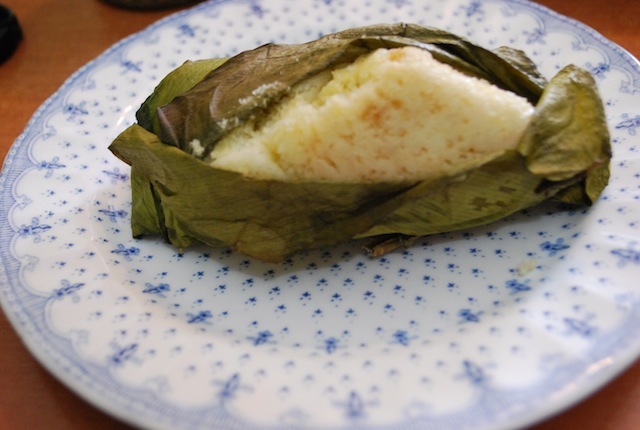 The Quimbolito is a dessert native to the Sierra region that’s also steamed, although this time in taro leaves. The spongy pocket is made from corn flour, orange juice, vanilla essence and a generous helping of margarine punched into dough that’s sprinkled with raisins before being sealed and steamed. Like many Ecuadorian sweets, it is consumed more as a snack or pastry than after meals, perfectly paired with a cup of coffee or hot chocolate. The term ‘comfort food’ doesn’t even begin to describe it. Ceviche Mixto. Photo courtesy of Patcito. 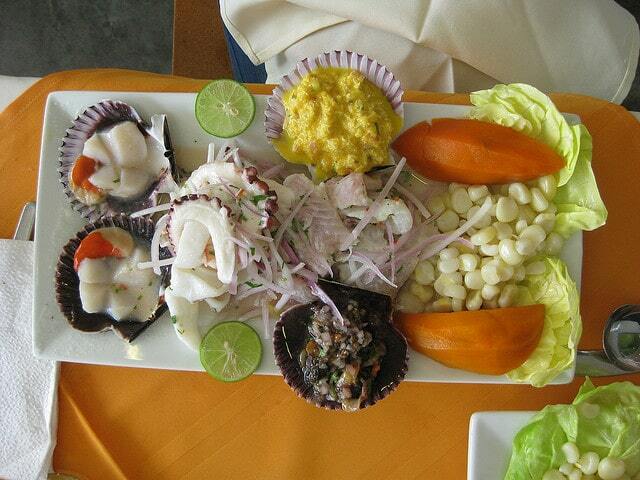 I’ll flat out admit total bias – Ecuador’s take on ceviche is the best. The seafood dish can be found all over Latin America, but preparation is what really matters here. In a ceviche mixto, anything from shrimp and sea bass to mahi-mahi and black clams are soaked in a marinade of lime juice, tomato, cilantro, and red and green peppers for hours, lending the mariscos a gummy texture and sweet, tangy flavor. It’s usually topped with fried plantains or tostado, crunchy corn grains fried to perfection. Guatita is a coastal dish made from tripe, meticulously scrubbed with lemon brine and stewed with potatoes in a peanut butter sauce until tender. It’s traditionally served piping hot with rice and a salad of purple cabbage on Sunday mornings. Tip: Guatita is an epic hangover cure. Sipping Canelazo in Banos, Ecuador, about 180 kilometers outside of Quito. Photo courtesy offabulousfabs. 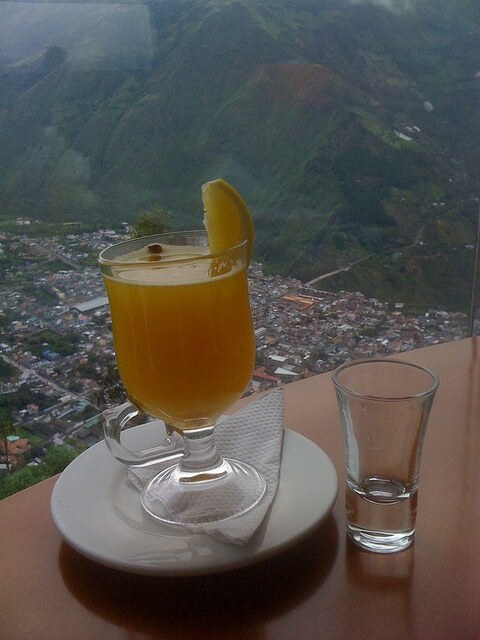 The welcoming drink of the Ecuadorian Andes is a traditional glass of canelazo, an infusion of naranjilla juice and sugarcane liquor served hot to newcomers not yet acclimated to the heights. A strong, sweet cup of canelazo serves as an elixir for anyone suffering the effects of altitude sickness – or plain epicurean thirst. Brewed with cinnamon, clove and vanilla, the anise-flavored alcohol — known as punta — takes on an entirely different body, sliding down the throat like candied velvet.